Though macaroni and cheese gets its name from the type of noodles traditionally used to make it—elbow macaroni—you can make this dish with a variety of noodle types. You just want to make sure that you choose noodles that catch the cheese (because there’s nothing more important than achieving maximum cheese consumption in each and every bite). Stay away from stringy noodles like spaghetti and linguine and opt for shells or bow-ties instead—they have those nooks and crannies perfect for holding pockets of cheesy goodness. You can also customize the cheese in your macaroni and cheese recipe. Sharp cheddar, white cheddar, Gouda, Gruyère and Parmesan are all popular options. Heck, why stop at one cheese? 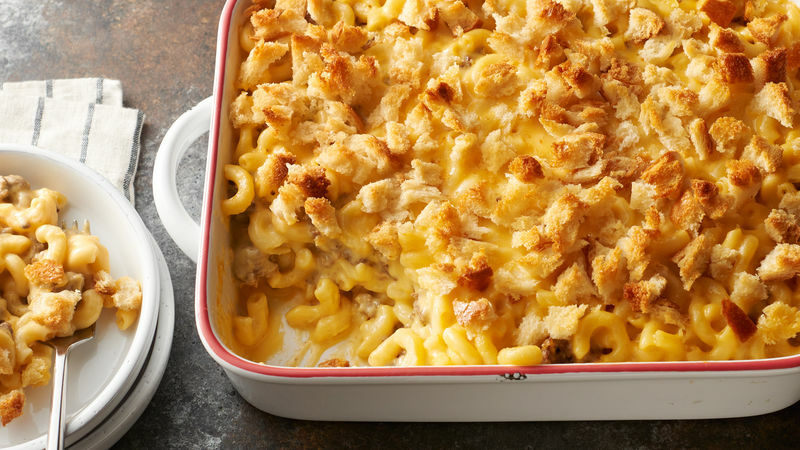 Some of the best mac and cheese recipes combine a few different types of cheese together to give you a flavor-blasted dish with a perfect cheese pull. Top it all off with some herbs and bread crumbs, and you have the fanciest macaroni and cheese dinner around.